We are grateful for the support of our Empower Fellowship Advisory Committee in shaping this fellowship and for their ongoing commitment to the disability community. 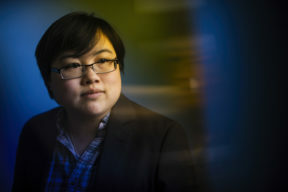 Photo by Adam Glanzman/Northeastern University [Photo Description: Headshot of Lydia Brown, young East Asian person, with stylized blue and yellow dramatic background.]. Lydia X. Z. Brown is a disability justice advocate, organizer, and writer whose work has largely focused on violence against multiply-marginalized disabled people, especially institutionalization, incarceration, and policing. They are currently a Justice Catalyst Fellow at the Bazelon Center for Mental Health Law, providing legal representation and self-advocacy education to Maryland students with disabilities facing school pushout, disproportionate discipline, and criminalization. Lydia is also past Visiting Lecturer at Tufts University, where they taught a course on critical disability theory, public policy, and intersectional social movements, and past chairperson of the Massachusetts Developmental Disabilities Council. In collaboration with E. Ashkenazy and Morénike Giwa-Onaiwu, Lydia is the lead editor and visionary behind All the Weight of Our Dreams, the first-ever anthology of writings and artwork by autistic people of color and otherwise negatively racialized autistic people, published by the Autistic Women & Nonbinary Network. Morénike and Lydia also co-direct the Fund for Community Reparations for Autistic People of Color’s Interdependence, Survival, and Empowerment, which provides direct support, mutual aid, and community reparations to individual autistic people of color. Lydia has received numerous awards for their work, and written for several community and academic publications, but they remain most passionate about their creative writing adventures. 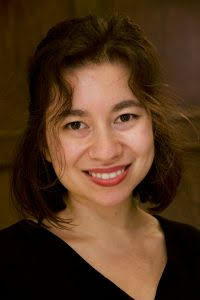 Image description: Headshot of Alison Lee Sikowitz, young East Asian, Ashkenazi woman against brown background. 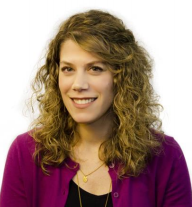 Alison Lee Sikowitz is a community organizer for the Jewish Alliance for Law and Social Action (JALSA). She became passionate about social and economic justice while organizing campaigns for campus workers’ rights and co-facilitating a political education class at Tufts University. Prior to her role with JALSA, Alison worked at the Boston Medical Center’s Immigrant & Refugee Health Program to improve immigrant patients’ access to legal services. She is a 2018 graduate of the JOIN for Justice Jewish Organizing Fellowship and has a B.A. in American Studies from Tufts University. Image description: Headshot of Rabbi Lauren Tuchman, young white woman wearing a kippah, with stained glass windows in the background. Rabbi Lauren Tuchman received rabbinic ordination from the Jewish Theological Seminary in 2018 and is, as far as she is aware, the first blind woman in the world to enter the rabbinate. 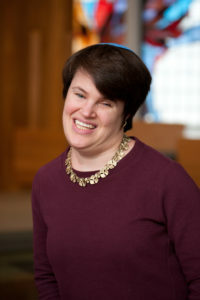 A sought after speaker, spiritual leader and educator, Rabbi Tuchman has taught at numerous synagogues and other Jewish venues throughout North America and was named to the Jewish Week’s 36 under 36 for her innovative leadership concerning inclusion of Jews with disabilities in all aspects of Jewish life. Rabbi Tuchman is an alumna of JOIN’s Seminary Leadership Project and online course, Don’t Kvetch, Organize! Image Description: Headshot of Madeline Wenzel, young white woman with light brown curly long hair, wearing a black shirt and a purple cardigan with a white background. Madeline Wenzel has been working in the disability field for over fifteen years. She is currently the Director of Community Engagement and Disability Services at Jewish Vocational Services in Boston where she oversees all of the disability programming. As Director, she worked with partners to design a new program model of vocational training for young adults with a disability called the Transitions to Work program. The program has received several awards including the 2016 Program of the Year Award from the International Association of Jewish Vocational Services. Madeline serves on many disability committees focused on enhancing services to people with disabilities in the Boston Community. She holds a Bachelor’s Degree in Psychology. Image description: Black and white headshot of Victoria Rodríguez-Roldán, a Latina woman in her late 20s. She is smiling, has eyeglasses, and is wearing a white shirt with a black blazer. Victoria M. Rodríguez-Roldán, J.D. is the Trans/Gender Non-Conforming Justice Project Director and Disability Justice Project Director at the National LGBTQ Task Force. Particular areas of expertise and focus are the intersections of issues affecting transgender people with disabilities and mental illness, anti- trans workplace discrimination and gun violence prevention from a social justice lens. 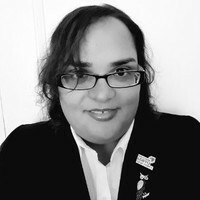 She has been in trans advocacy the entirety of her adult life, including advocacy in Puerto Rico and in Maine. Victoria is the author of “Valuing Transgender Applicants and Employees,” a gold-standard best practices guide for employers, and frequently speaks on discrimination issues impacting the trans community. She was named the Autistic Self Advocacy Network’s 2016 Ally of the Year Award and has been profiled in NBC News and Latina Magazine, among other outlets. Prior to joining the Task Force, she worked as an Equal Opportunity Specialist for the U.S. Department of Labor’s Civil Rights Center. Victoria holds a B.A. in Psychology with honors from the University of Puerto Rico, and a J.D. from the University of Maine School of Law. Headshot of Colin Killick, young white man with chin-length hair wearing a blue shirt and black blazer in an office. 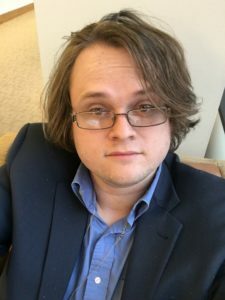 Colin Killick is the Deputy Director of Disability Policy Consortium (DPC), a disability civil rights advocacy and research organization based in Malden, MA. He lives in Somerville, MA, where he chairs the Mayor’s Commission for Persons with Disabilities. He is a 2012 graduate of Williams College and a 2018 graduate of the Harvard Kennedy School of Government, where he founded the student Disability Justice Caucus and won the Robert F. Kennedy Award for Public Service. As part of the 2014-15 class of JOIN for Justice Fellows, he was placed at DPC as an organizer, where alongside Allegra Heath-Stout (now JOIN’s Fellowship Director) he co-founded the Housing Advocacy Leadership Team (HALT). This effort, a partnership with Boston Center for Independent Living, has successfully advocated for nearly $3 million in new state funding to provide housing to low-income people with disabilities since 2013. He currently supervises an advocacy team that includes both another JOIN alum and a current JOIN Fellow, and has served as a JOIN trainer for the last three years. He has a neuromotor disorder and a learning disability, and believes his 504 accommodations changed his life–something that the courageous organizing of disabled activists made possible.